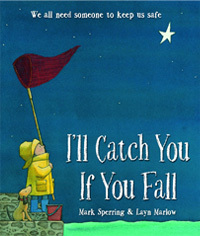 The boy in I’ll Catch You If You Fall wants to keep his star safe. 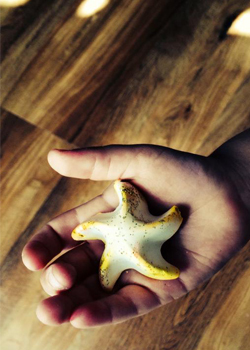 Here’s how you can make a little star of your own to look after. 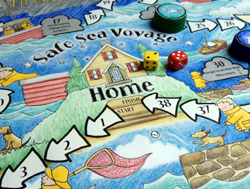 And while you’re waiting for your star to set, try playing the Safe Sea Voyage board game! 1. 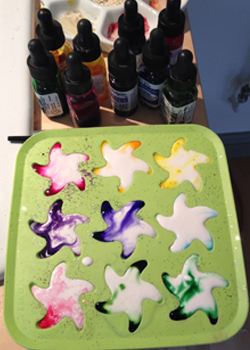 Sprinkle a little glitter and a pinch of pasta stars into your mould. 4. Carefully pour the plaster mixture into your mould. 5. Wait about 1 hour for the plaster to set, then pop out your sturdy little star! Will you put it in your pocket or find a special little box in which to keep your star safe? Twinkle, twinkle, little star! How I wonder what you are. 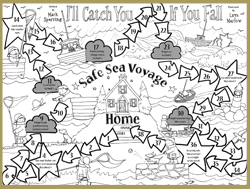 Click on the black and white image to download a pdf of the game board. The sheet includes instructions and can be printed onto A3 paper. I wonder if you’ll catch a fish? One, two, three, four, five – once I caught a fish alive! Six, seven, eight, nine, ten – then I let it go again. Because it bit my finger, so.